For years the Ruskin Park Paddling Pool has provided a cool space in which children can splash about while families and friends get together for an ice cream and just relax. But due to Lambeth Council Funding cuts the pool will close this year unless maintenance funds can be found. A community group has formed in conjunction with the Friends of Ruskin Park to fundraise £5,000 to keep the pool open this summer. 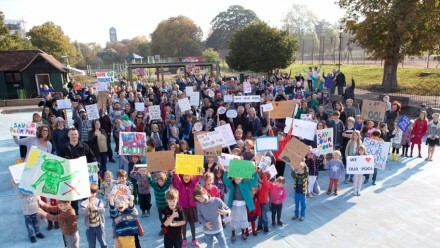 Join our Facebook group: “Save Ruskin Park Paddling Pool” and be kept up to date with funding and progress, you can offer to volunteer painting if you like! Display an Urban Village board outside your property and Urban Village will donate £100 per board to the fund.